Remember that famous comedy series from years ago? The one with the bald man, and the guy who loved to dress as a woman at every chance he got? Well they made a slot machine of it. 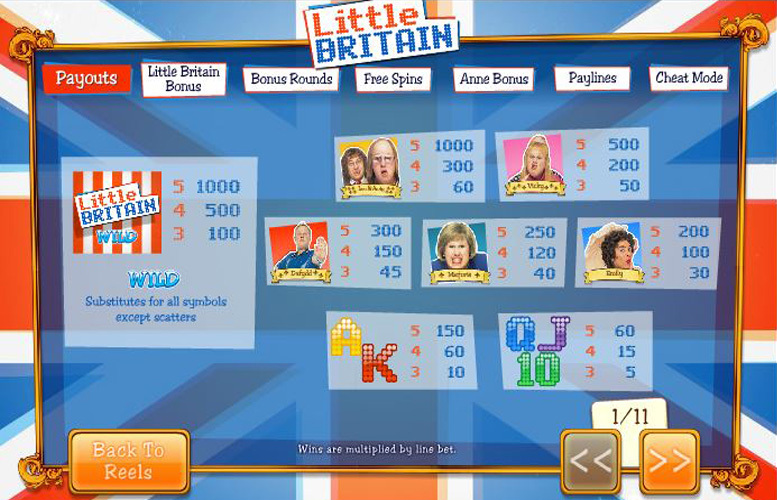 Introducing the Little Britain slot from Playtech. Fans of the show will probably love this machine, and everyone else, well they’ll just not get it. Unfortunately, I fit into the latter category. It’s not for me. Let’s keep it objective though, and see what this slot machine has got to offer. Plenty of nods to the original material. Loads of references, and fans of the show will love it. Lots of variety between bonus rounds. There’s about seven different ones, although there is a fair amount of overlap between many of them. It’s difficult to enjoy the game too much with so much Little Britain referencing going on. As someone who actively disliked the original programs it is hard to get past that. Little Britain logo wild = 1,000x the line bet. Lou and Andy = 1,000x the line bet. Vicky = 500x the line bet. Defydd = 300x the line bet. Marjorie = 250x the line bet. Emily = 200x the line bet. There are plenty of amusing game features to keep fans of Little Britain happy. Many of the bonuses are inspired directly by one of the iconic characters. 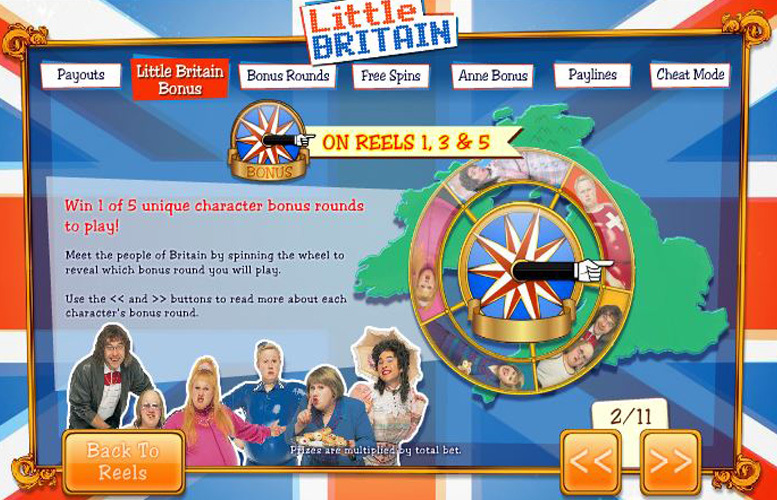 The game awards the Little Britain bonus if a player successfully lands the bonus symbol on reels one, three, and five at the same time. They must spin the wheel to reveal which bonus they’ll receive. There is a total of five, each inspired by a different one of the memorable characters of the series. Players must help Vicky by picking something for her to do. The longer the bonus continues, the greater the potential prize awarded. The highest possible is a massive 750x the total bet. Here players must pick objects for carer Lou to hand to his friend Andy. If Andy likes what you’ve picked you will receive additional multipliers, if he doesn’t you lose a life. Displease Andy three times and the bonus ends. There’s a total of 1,000x the size of your bet up for grabs in this round. Here we must help Little Britain’s resident nutritionist picking food for her classes. Under each platter lid there’s a different item of food. Healthy foods mean bigger prizes and too many fatty ones cause the bonus to end. The most a player can win in this bonus is 500x their initial stake. Here we must help the “only gay in the village” to get himself dressed. Players must shuffle the items of clothing to reveal full outfits. They get three chances to mix up Dafydd’s wardrobe and their prize increases for every matching set they manage. There is also a “one extra shuffle” icon on offer during this round, and the maximum winnings possible are 500x the value of each line bet. Help Little Britain’s own drag queen Emily find her lady things. Players must select objects in Emily’s room for cash prizes. Feminine objects reveal larger prizes. These include increased win multipliers, and additional picks. The largest possible win here is a reasonable 500x the value of the line bet. By landing the “LB Free Spins” symbols on reels 2,4, and 5 players will receive 10 free spins. In addition to this generous offering, there are special wild stacks placed within the reels for the freebies. Not only are these symbols wild, land a full character on a reel, and you’ll win up to 100x your initial bet. During the base game, Little Britain character Anne can randomly appear. She throws objects at the reels and turns various symbols wild, for extra shots at winning. There’s also a “cheat mode” that players can access. To do so they must open the slot information section, and scroll through to the eleventh page. You’ll literally not believe what happens! Queen, Jack, or 10 = 60x the line bet. Players can vary the number of lines they play using, as well as the size of each bet per line. There are up to 30 lines available. The highest bet per win line is £25, and the lowest is 1p. With all variables set to the minimum, the lowest wager per spin possible is just 1p, and with all values maxed out, the highest is an impressive £750. 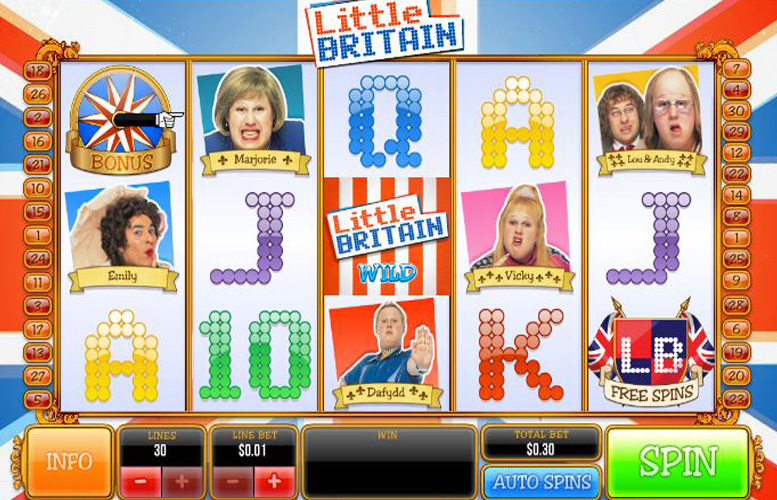 There are some interesting game features present in the Little Britain slot machine, and thematically it matches the original content its design was based on well. Those who love the series will certainly love this game. Those who don’t have a strong opinion either way will likely find many aspects of the machine enjoyable. If like me, you can’t stand Little Britain, you might be better off finding a different machine to play. This game has a rating of 3 / 5 with 378 total reviews by the users.